It is one of the most well-known mythological weapons we have heard of, Thor’s hammer, the protector weapon of Asgard, which helped prevent the destruction of the celestial city of Asgard by giants. 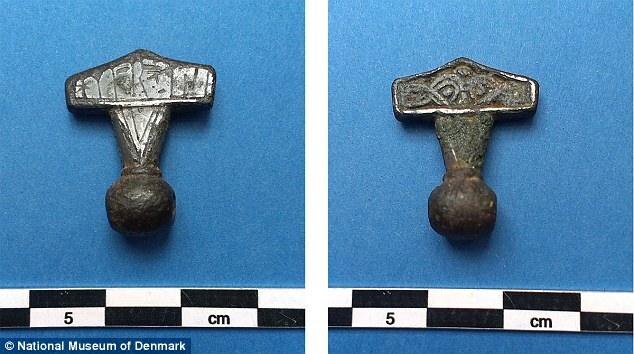 The discovery was made in Denmark, on the island of Lolland, where archaeologists have successfully unearthed a 10th century “torshammere”, ending a long debate between archaeologists and historians on how the legend of Thor’s hammer influenced Viking mythology and their jewelry. “This is a hammer,” says the inscription carved on a metal amulet 2.5 cm making it the only one with an actual inscription. The identification label, written in runic alphabet -used by the great Vikings- makes this discovery a unique piece among a thousand of similar works that have been found in Scandinavia, the British Isles, Russia and the Baltic countries, according to archaeologists, it is believed to represent the weapon of the god of thunder, Thor called Mjolnir. The discovery of this unique piece was made by Torben Christjansen, an amateur archaeologist, using a metal detector. In Denmark, the use of metal detectors to search for antiques is legal, although each artifact found should be handed over to the National Museum, which determines its origin, authenticity and eventually awards it to the discoverer. “There is a very close collaboration between museums and amateur archaeologists. We benefit from their work, “says Henrik Schilling, public relations officer of the museum, where the discovered piece is being analyzed, becoming a part of the museum’s collection afterward. Researcher Lisbeth Imer from the National Museum of Denmark was in charge of translating the inscription “Hmar x is.” In a statement from the institution, the specialist describes the discovery as unique and says she has no doubts over the words which are meant to say “hammer,” but points towards the fact that the inscription was misspelled. The author of the inscription missed the first vowel of the word hammer,” she said, arguing that this omission could be for reasons of space. Nevertheless, everyone is grateful to the mysterious author of the inscription as it made it possible to finally clarify doubts that researchers had in the past regarding Thor’s hammer. Everyone at the National Museum of Denmark is quite happy with the discovery; scholars argue that these hammer-shaped amulets were not just ornamental piece as many believed them to be, but this discovery actually points towards evidence as the representation of the mythical hammer of Thor. In Norse mythology, Mjölnir (pronounced roughly ‘miol-neer’) is described as being one of the most powerful weapons ever made, capable of great deeds, destroying and building. It’s only owner was Thor, the mythical God of Thunder and protector of Asgard. According to a report in Past Horizons, this historical object is cast in bronze but has traces of silver and gold plating. Ever since researchers have been doing excavations in the Viking nations, thousands of objects have been unearthed, but none of them had the importance as this discovery.